Anaerobic digestion breaks down organic wastes in the absence of oxygen and produces biogas. Methane (CH₄) and carbon dioxide (CO₂) are the two major components of the produced biogas, accompanied by many other impurities such as nitrogen (N₂), oxygen (O₂), hydrogen (H₂), hydrogen sulfide (H₂S) and ammonia (NH₃). Conversion of biogas to bio-CNG (Compressed Natural Gas) or injection into a natural gas pipeline usually requires a much higher CH₄ purity, thus calling for feasible technologies to clean up raw biogas generated from either anaerobic digesters or landfills. This fact sheet discusses the composition of biogas and introduces typical commercially available biogas cleaning and upgrading technologies. A typical biogas composition is shown in Table 1. Biogas generated from anaerobic digestion (AD) is very similar to that produced from landfills, but both are quite distinct from natural gas. The existence of impurities in biogas may cause problems. High concentration of O₂ is explosive. H₂S is corrosive to steel in reactors and engines when biogas is used for electricity production. Chlorines are toxic, forming polyhalogenated dioxins. Siloxanes may lead to formation of microcrystalline quartz, which can deposit on surfaces and cause clogging issues. When biogas is used for heating and electricity production, only water and H₂S removal is required. However, most of the gaseous impurities need to be removed for pipeline injection and transportation fuel conversion. According to U.S. pipeline specifications, natural gas pipeline injection requires purified bio-gas containing CO₂, water and H₂S contents of less than 3%, 112 mg/m³ and 4 ppm, respectively . Most bio-CNG practices require purified biogas to have higher than 97% of CH₄. For liquefied bio-CH₄, biogas has to be purified until it contains less than 25 ppm, 4 ppm and 1 ppm of CO₂, H₂S and H₂O, respectively, to prevent dry ice formation and corrosion . Therefore, the need for biogas cleaning and upgrading is application dependent. Table 1. Composition comparison. Adapted from . Table 2. Biogas cleaning methods, number of plants and averaged purities of output CH₄. Adapted from . Removing biogas impurities other than CO₂ is referred to as biogas cleaning, while further separating CO₂ from biogas is known as biogas upgrading. Commonly used methods are listed in Table 2, together with the number of industrial plants worldwide using them and their achieved CH₄ purities. Water scrubbing (Fig. 1) removes both CO₂ and H₂S simultaneously by taking advantage of their higher water solubility compared to CH₄. 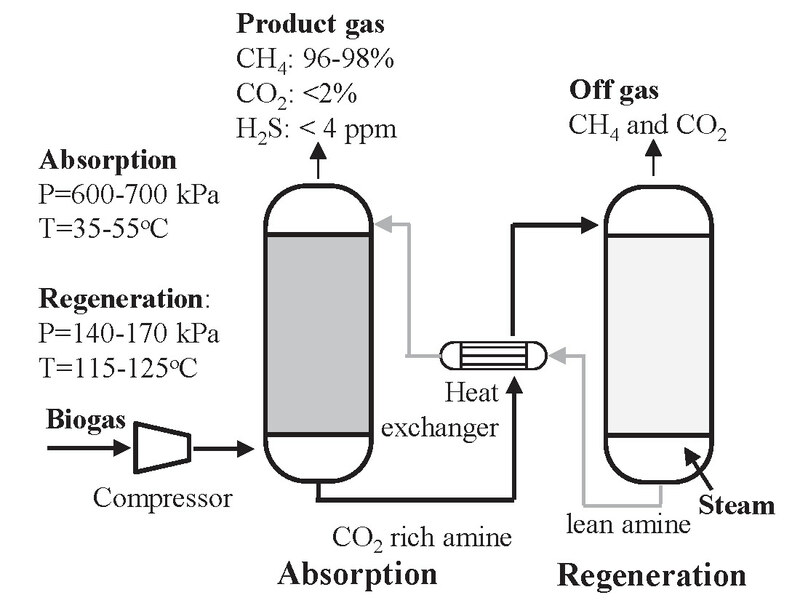 To enhance absorption, biogas is usually compressed. After absorption in the scrubber, the purified biogas, which contains more than 97% CH₄, is collected from the top of the scrubber, while liquid effluent containing high concentrations of CO₂ and a trivial amount of CH₄ is treated in a flash tank to recover CH₄. The water is then regenerated in the stripper with air blown (air sparging) into the reactor. Pressure swing adsorption (PSA, Fig. 2) uses the adsorbent's pressure dependent gas adsorption rate to capture preferred gases at a high pressure, and then release the adsorbates at a low pressure to regenerate the adsorbent. 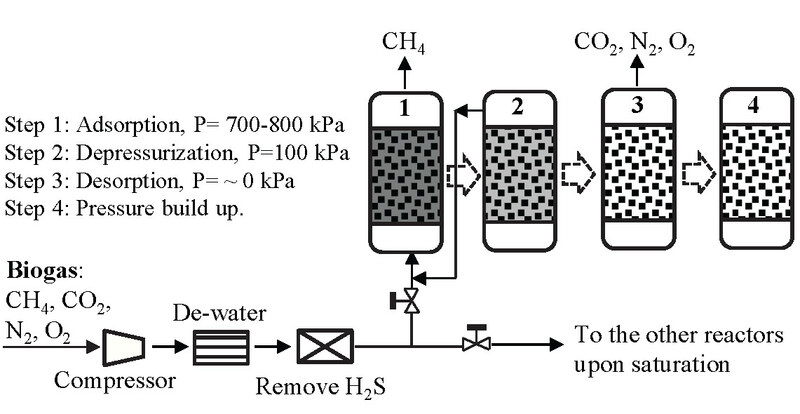 In the pressurized vessel (step 1), impurities having high gas adsorption rates are adsorbed, while enriched CH₄ is collected from the top of vessel. The saturated vessel is then depressurized to around atmospheric condition (step 2) for desorption of the impurities. As the gas released in this step contains both impurities and a small amount of CH₄, it is recycled. The pressure is further decreased to a near vacuum in step 3, which de-adsorbs captured gases and regenerates the adsorbents. The gas that leaves the vessel in this step mainly consists of CO₂, N₂ and O₂. Pressure is built up in step 4 for the next cycle. Amine solvents, such as monoethanolamine (MEA), diethanolamine (DEA) and methyldiethanolamine (MDEA), can selectively absorb CO₂. In the amine absorption system (Fig. 3), absorption happens at a high pressure and a relatively low temperature (35–55°C), with the high purity CH₄ collected from the absorption reactor. The CO₂ enriched solvent is then regenerated at a temperature of 115–125°C with a steam flush. A heat exchanger is usually employed to pre-heat the CO₂-rich amine using the hot lean amine for energy saving (Fig. 3). The design principle of membrane permeation is that under a certain pressure, gases with high permeability (e.g., small molecular size and low affinity) can be transported through the membrane while gases with low permeability are retained. As shown in Fig. 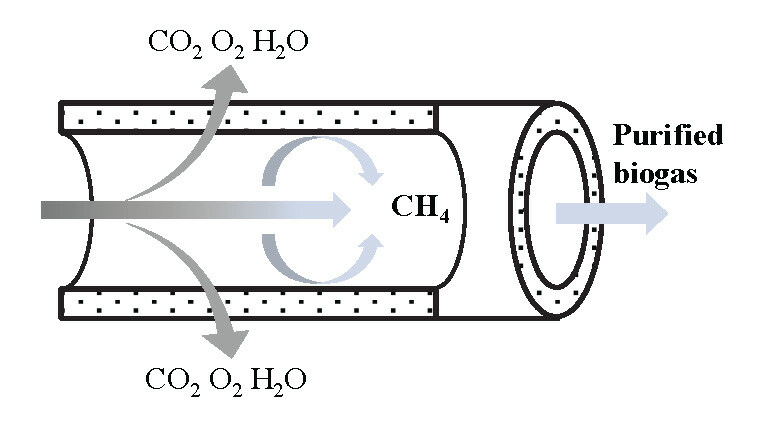 4, high permeable impurities such as CO₂, O₂ and H₂O pass through the membrane as permeate, while low permeable CH₄ is retained and collected at the end of the hollow column. Cryogenic technology takes advantage of the different boiling points of gases and progressively cools the biogas to obtain high purity CH₄. Most impurities can be condensed at -25°C, and CO₂ can be frozen and separated from the gas stream at -78.5°C. Benefits and drawbacks vary among these methods. Water scrubbing is able to remove CO₂, H₂S, NH₃ and dust at the same time, but needs lots of water. Pressure swing adsorption requires low energy input, but needs pretreatment to remove H₂S and water, which may damage adsorbents. Amine absorption usually shows low CH₄ loss and produces high quality CO₂, but is energy intensive. Membrane permeation systems are compact and easy to operate, but with a relatively low CH₄ purity [5, 6]. Figure 1. 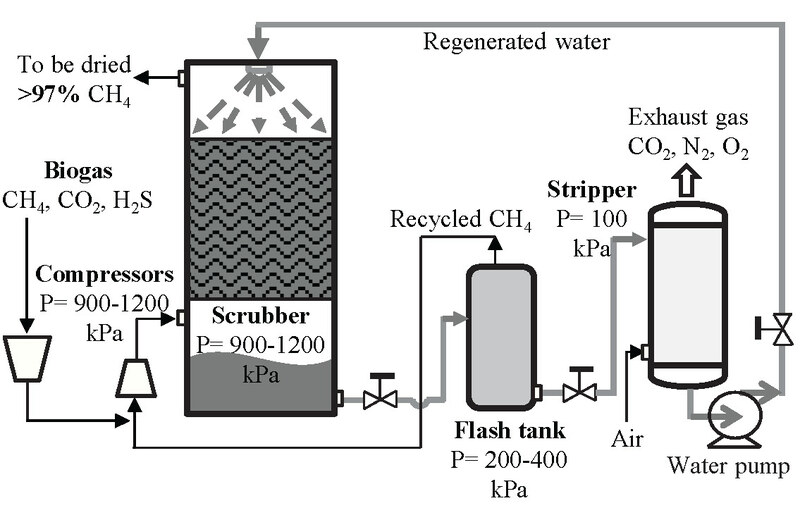 Schematic diagram of water scrubbing. Figure 2. Schematic diagram of PSA. Figure 3. Schematic diagram of amine absorption. Figure 4. Schematic diagram of membrane permeation. Biogas purification is usually a high energy demanding process. However, the appropriate choice of cleaning and upgrading method based on CH₄ purity requirements can save energy and reduce CH₄ loss, especially for large-scale biogas plants. The biogas cleaning and upgrading methods are quite different from each other in design principle, supporting materials, and energy demand, and consequently are varied in raw biogas handling ability and CH₄ purity. Therefore, selection of cleaning and upgrading methods depends on the biogas composition, the available resources (e.g., water, electricity and space), and the target CH₄ purity. This fact sheet can be used as a starting guideline for evaluating future practices. Korres, N.E., O'Kiely, P., Benzie, J.A., and West, J.S. 2013. Bioenergy production by anaerobic digestion: Using agricultural biomass and organic wastes. Routledge. IEA Bioenergy. Up-grading plant list. 2013. iea-biogas.net/plant-list.html. Ullmann's Encyclopedia of Industrial Chemistry, 1986. Johansson, N. 2008. Production of liquid biogas, LBG, with cryogenic and conventional upgrading technology. Lund Institute of Technology, Sweden. Persson, M., and Wellinger, A. 2009. Biogas upgrading to vehicle fuel standards and grid introduction. Biogas upgrading and utilization. Patterson, T., Esteves, S., Dinsdale, R., and Guwy, A. 2011. An evaluation of the policy and techno-economic factors affecting the potential for biogas upgrading for transport fuel use in the UK. Energy Policy. 39: 1806–1816.